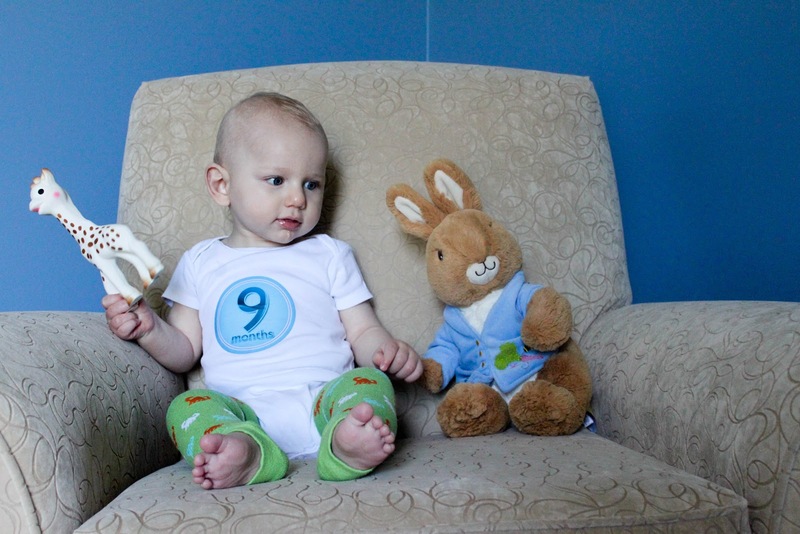 I Love You More Than Carrots: Happy Nine, Carter! 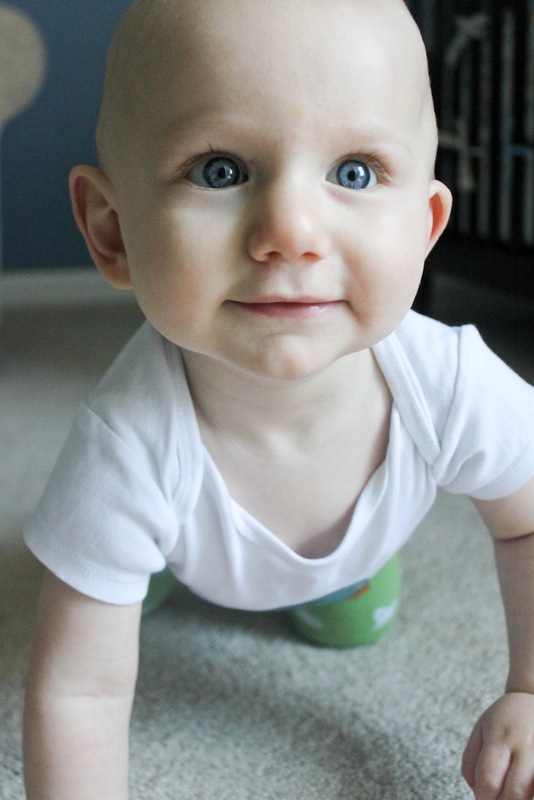 Carter Michael, you are nine whole months old. Every Mama says the same thing each month. Every month it's more. You're more fun! We love you more! You do more, see more, eat more! And truer words have never been spoken. Some say "Trouble" should be your middle name, but I think it should be "Explorer." Or maybe "Handsome." Yes, definitely "Handsome." Sweet boy, what a month it's been. You are growing and learning by leaps and bounds. It's been nothing short of a sheer blessing to watch as you discover more of the world around you, learning new things every day! You began crawling on Easter Sunday. 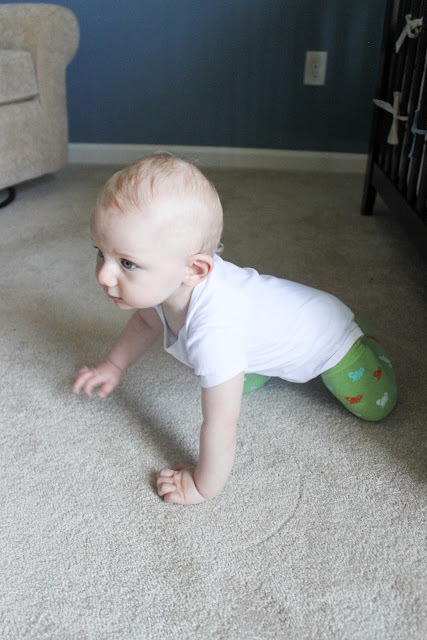 After months of "rocking" on all fours, it was as if you suddenly decided, "today's the day! 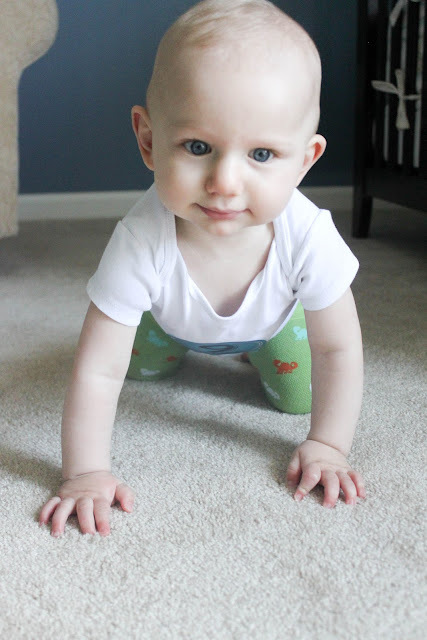 I'm going to crawl!" And just like that, you were off. Both Daddy and Gammie were there to see you take your first "crawls" and you can bet it made each of them the happiest Daddy and Gammie on the planet. Needless to say, you've been unstoppable ever since. We lowered your crib down to it's lowest setting after waking up to you standing in there, as if to say, "Hey, Ma! It's breakfast time and I'm ready!" You're pulling yourself up on everything you can get your hands on. This includes your Mama and Daddy, the Sheepie, the couch, the steps and especially Sheepie's water bowl. It's your favorite place to play. You say "Mama" and even pointed to a picture of a lady with long brown hair in a magazine and announced to Gammie, "Mama!" I couldn't make this up, as Gammie was there to see it! You're such a smart one, Little C! You've also started saying, "Uppph!" when you want something. You outstretch those arms, wiggle those hands and say "Uppph" over and over and over again until you're given what you desire. At first we thought it was you, asking for "Up!" But then we realized you say it all the time. At any given moment, when left to your own devices, you love doing "So Big!" and then clapping for yourself. You get the aboslutle biggest kick over clapping and excitedly yell "Aaaaaaaay!" when you do. It's definitely Mama's favorite trick. Your hair is coming in curly behind your ears and along your neck. The minute it gets wet or you're hot and sweaty, those curls spring out in full force! Hopefully you've inherited Daddy's blonde curls! As he likes to say, "The curls get the girls!" So many new tastes this month, Sweet boy! You started noming on yogurt, kiwi, blueberries and acorn squash with brown sugar and cinnamon. We still haven't found any food you don't like! We've also just recently started table food and boy, are you one fiercely independent child. You LOVE banana chunks rolled on graham cracker dust and will throw the biggest tantrum if Mama doesn't make them for you fast enough. You also love to snack on baked sweet potato fries! You attended your first Baby Shower this month and everyone couldn't get over how well-behaved and what an absolute happy baby you are. Everyone is ALWAYS telling Mama how observent, alert and smiley you are! As if I didn't know! But it's so true, Carter. Such a mellow little man, always going with the flow! You're still taking only one nap per day. In the beginning of the month, it was never for more than 30 minutes, but lately you've been going down for at least an hour. It's truly Mama's saving grace! With the warm weather rolling in, we've been heading out to the park a lot. You love the swings but loathe the slide! Big, fat crocodile tears will stream down your face when I sit you at the bottom of the big, yellow slide! You also don't care much for your jogging stroller. That was $400 well spent. I think it has a lot to do with the fact that there isn't a snack tray attached and lord knows, you love your snacks. Hopefully we'll remedy this soon! You celebrated your First Easter in New Jersey with Gammie and Poppy where you proceeded to fall asleep during Mass. The Bunny was very kind to you and you loved tearing through your basket pulling out all of your treats! You cut your third tooth this month, your top middle left. The right one isn't very far behind at all! 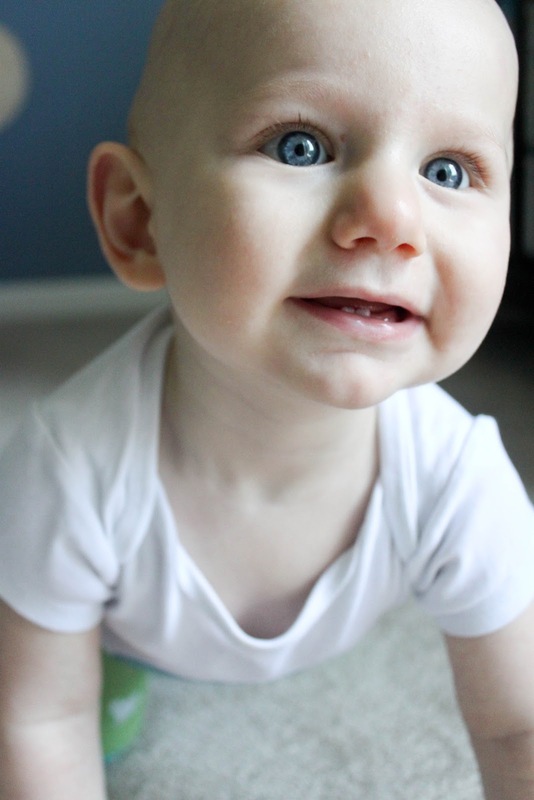 Once again, Motrin and Hyland's Teething Gel are our go-to's. You also love to nom all over those cheap frozen teething rings. Speaking of things you loathe, elevators are the devil. The dryer runs a close second to being The Scariest Thing on Earth. The minute you're within reach of either, those Big Fat Crocodile Tears make an appearance. It breaks my heart, but I can't help and laugh a little, silly boy! You wear a size 5 shoe, size 4 day diaper and size 5 overnight diaper. Breaking the clothes bank, you're wearing 18 month tops, 12 month bottoms and 18 month one-piece sleepers, rompers and shortalls. 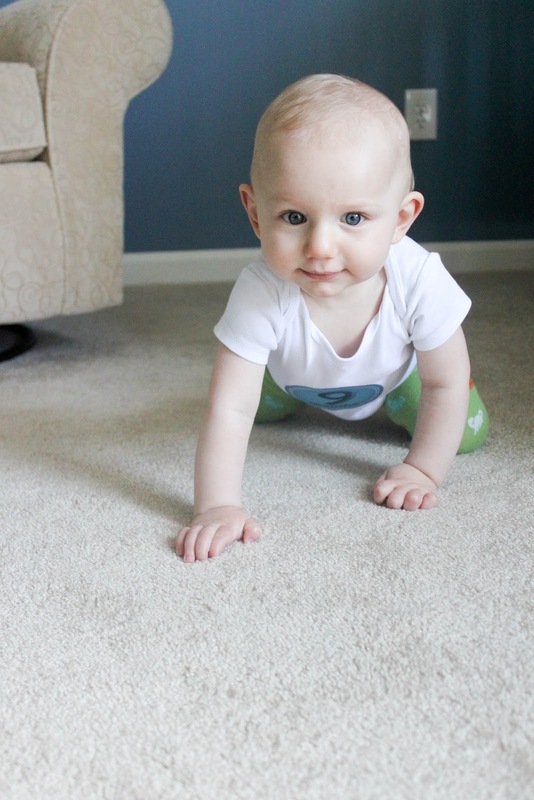 I have no doubt that you'll be in size 24 month by your 1st birthday! 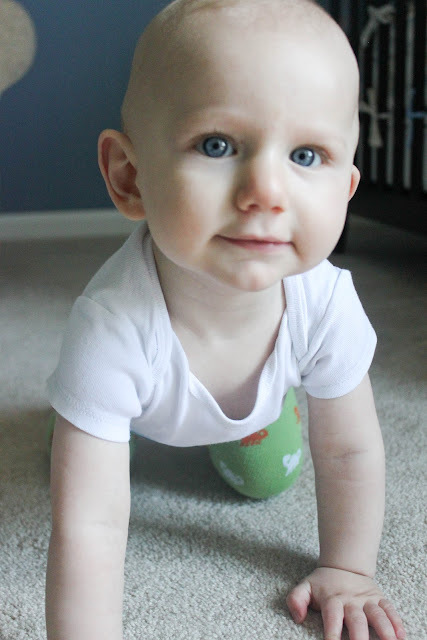 Happy Ninth Month Birthday, Sweet C! Your Mama and Daddy love you to pieces! 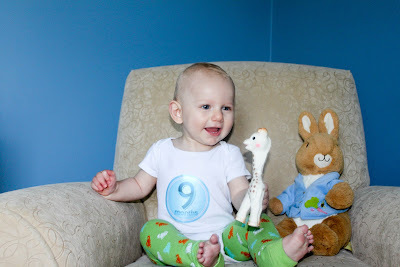 Aww happy 9 months Carter! They grow up so fast! So big!!! Love those baby leggings. He is seriously one of the most beautiful babes I've ever seen! Hopefully, he will continue to love all foods (unlike my picky husband!) Ha! I can't imagine what it feels like to hear someone calling you "Mama" - so sweet! Happy 9 Months to your beautiful boy! Happy 9 Months C! He is getting so big and sounds like a very busy guy. I am so jealous your guy is calling you Mama. Your heart has to melt everytime you hear that. Happy 9 months little (big) guy! P.S. Do you think the bananas rolled in graham crumbs would work the same rolled in rice or oatmeal cereal? E wants to feed herself LIKE WHOA but most of the things that I can give her are too slippery for her to pick up. We haven't introduced wheat so I can't do the graham crumbs but I was thinking of trying something similar? 9?!?! what! didn't we JUST do 8?! sheesh. time is flying by TOO fast! Gosh he is adorable! Yay for your 1 hour break :-) My son (almost 15 months) is the complete opposite...he LOVES slides and hates swings. And Colton also LOVES the dryer. He for real helps me with the laundry. He is so cute..you get the best pictures of him! With those eyes... you don't stand a chance girlie ;) He's going to rule the world!! I can't get over how adorable he is!! How much do you think he weighs?! Happy 9 months Carter! Size 5 shoe???? Tommy is almost 20 months and just started wearing size 5s about a month or 2 ago! Yikes! I knew he was wearing close to the same size clothes (we're starting to have to retire some of the 18 month size outfits), but that is amazing! I hope he stays a good eater for you. Vegetables are the devil now - and that's all Tommy used to eat when we were on the pureed foods...I'm just thankful he still likes strawberries and pears! these photos are too stinkin cute!! I saw kiwi and acorn squash at the produce stand the other day. I wasn't sure about them but I have to try them now. I am jealous of his verbal skills. G is already walking holding onto furniture but all the child does is grunt. Makes an SLP mama a little sheepish. I can't believe how "mature" he looks in that first picture! 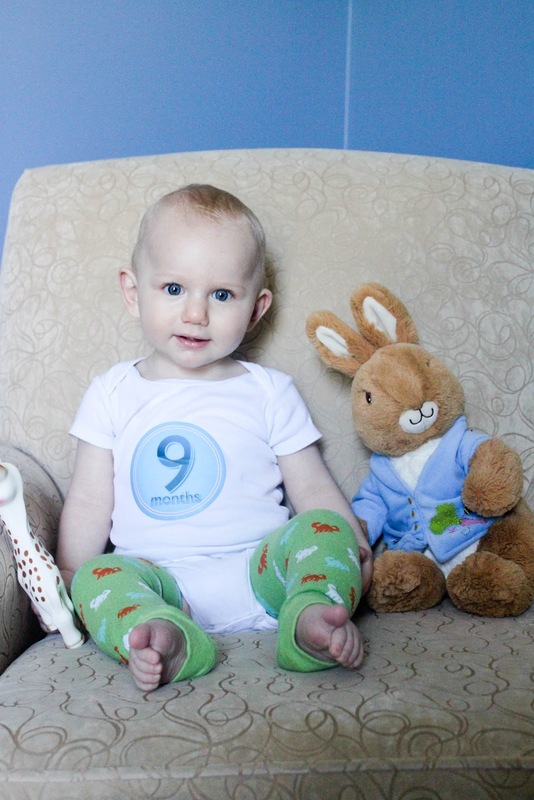 :) Happy nine months Carter! Very sweet! I enjoyed hearing all about C's progress. So many new things to look forward to!